I can't braid my hair, but I sure can make puff pastry look pretty! Another recipe with ingredients that are always on hand in our house. This one calls for Giardinera - a Chicago specialty. If you can't find it - or don't like it - you can substitute chopped olives, Muffaletta mix or even some chopped pickled jalapenos. You can also do all Artichoke or all hearts of palm, if that is more your thing! Preheat the oven to 400* and put a piece of parchment on each of 2 baking trays. 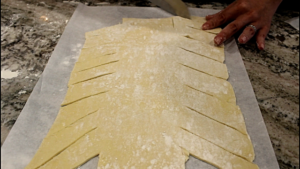 Lightly flour the work surface and roll out each piece of puff pastry into a larger rectangle. 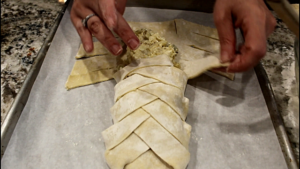 Move each piece to its own baking tray and cut 1 inch thick slices, at an angle, on each side of each piece. Leave about 4 inches unsliced running the entire length of the puff sheet. 3. In a large bowl, combine all of the rest of the fillings except for the egg. Taste for seasoning and make sure it is yummy! 4. 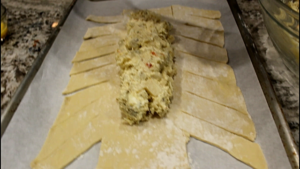 On the first piece of puff, put half of the filling running down the length. Fold the top piece down, then gently pull each slice up and over the filling, overlapping the angled slice to cover the filling. Repeat with the other puff and remaining filling. 5. Brush with the egg wash and slide into the hot oven for about 25 minutes, until golden brown and delicious. Let rest 10 minutes before cutting in slices and devouring!